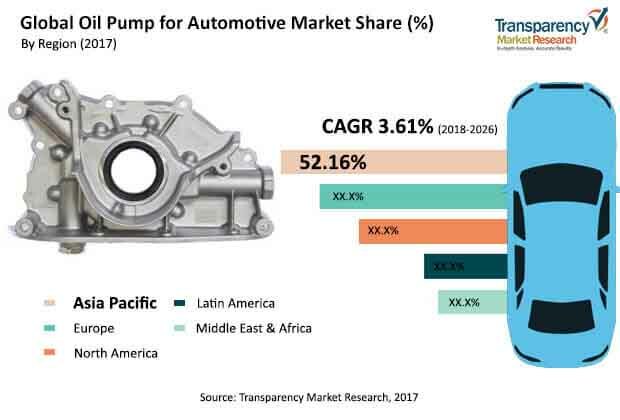 Global oil pump for automotive for automotive market is projected to grow at more than 3% CAGR during the forecast period 2018-2026, according to a new research report by Transparency Market Research (TMR). According to the report, the global market will continue to be influenced by a range of macroeconomic, vehicle production and industry-specific factors. Asia-Pacific will continue to be at the forefront of global demand, with the market in the region growing at above 3.2% through 2026. Lubrication forms a vital factor for engine health. Oil pump for automotive is used to lubricate the vehicle engine and the internal part of engine component to reduce the friction of the automotive component like pistons, cylinder head, piston rings, and others. Growing demand for vehicles, stringent norms to curb emissions, improvising fuel efficiency and improving manufacturing processes are prime drivers for the global demand for oil pump for automotive market. Additionally, the need to improve the lifespan of a vehicle and engine by plummeting wear & tear and enhancing cooling also are equally contributing towards increased demand for oil pump for automotive. Rising popularity of fuel-efficient cars is one of the latest trends that is gaining traction in the market propelling the demand for better oil pumps. Owing to stringent vehicle emission norms, the auto maker in most of the countries are concentrating on producing fuel-efficient, lightweight, and compact vehicles. The vendors are also emphasizing on the mileage and the price of the vehicle. Due to the potential oil shortage and varied climatic changes, countries including China, Japan, and several other European countries have already capped fuel economy standards to a low ceiling levels. As a result, customers will start preferring fuel-efficient cars, inducing manufacturers to produce fast and fuel-efficient vehicles. Variable displacement oil pump for automotive segment holds a prominent share of the global market. Variable oil pumps have the ability to vary the discharge of circulating oil depending upon the requirement. Electric oil pump type segment is anticipated to grow on account of the onset of PHEVs and HEVs. Norms for harmful carbon emissions due to rising pollution and global warming is projected to drive the global electric vehicle market in the near future which is also reflected by promoting greener vehicles. Government of various countries such as China and those in Europe are increasingly encouraging the purchase of low-emission electric vehicles, by providing incentives and subsidized schemes. Additionally, government subsidies such as tax exemptions and designated parking spaces for buyers of electric cars in Europe are also encouraging people to opt for electric vehicles. The passenger vehicle segment constituted more market share in 2017, which can be attributed towards the rising passenger vehicle production on account of increased disposable income, lowered car loan rates and easy finance availability in the emerging nations in the recent past years. Geographically oil pump for automotive market has been classified into North America, Europe, Asia Pacific, Middle East & Africa, and Latin America. Asia Pacific is the largest region in the oil pump for automotive market. The report projects oil pump for automotive market to grow at over 3% CAGR and surpass US$ 19 Bn by 2026. In 2017, Asia Pacific dominated the oil pump for automotive market with more than 35% share in terms of volume and is expected to follow the same trend during the forecast. Continuous increase in demand for passenger vehicles owing rapid urbanization, stable economic conditions, and lower interest rate. The market for oil pump for automotive is highly fragmented and each region of the market is dominated by a select number of players. For instance, the oil pump for automotive in Asia Pacific is dominated by Delphi Automotive and MAHLE GmbH which captures more than 30% of the market share. Furthermore, the Europe and North America is fragmented and is dominated by regional players. In these regions, giants such as Robert Bosch GmbH and Denso Corporation have significant share in the global oil pump for automotive market. The oil pump for automotive market, therefore, is characterized by the presence of Magna International, Rheinmetall Automotive, Johnson Electric and others. The oil pump for automotive market is highly fragmented with the presence of small and medium sized manufacturers.